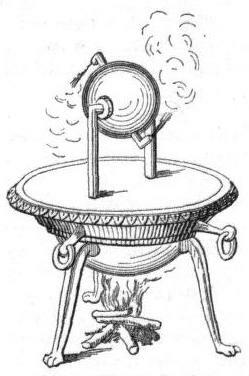 The first recorded example of a steam turbine was Hero's Aeolipile, a reaction turbine dating from about 60 A.D. Unfortunately no original examples remain. See more about Hero and his device. The first practical electricity generating system using a steam turbine was designed and made by Charles Parsons in 1884 and used for lighting an exhibition in Newcastle. Since then, apart from getting bigger, turbine design has hardly changed and Parson's original design would not look out of place today. Despite the introduction of many alternative technologies in the intervening 120 years, over 80 percent of the world's electricity is still generated by steam turbines driving rotary generators. Steam is mostly raised from fossil fuel sources, three of which are shown in the above diagram but any convenient source of heat can be used. In fossil fuelled plants steam is raised by burning fuel, mostly coal but also oil and gas, in a combustion chamber. Recently these fuels have been supplemented by limited amounts of renewable biofuels and agricultural waste. The chemical process of burning the fuel releases heat by the chemical transformation (oxidation) of the fuel. This can never be perfect. There will be losses due to impurities in the fuel, incomplete combustion and heat and pressure losses in the combustion chamber and boiler. Typically these losses would amount to about 10% of the available energy in the fuel. Steam for driving the turbine can also be raised by capturing the heat generated by controlled nuclear fission. This is discussed more fully in the section on Nuclear Power. Similarly solar thermal energy can be used to raise steam, though this is less common. Steam emissions from naturally occurring aquifers are also used to power steam turbine power plants. 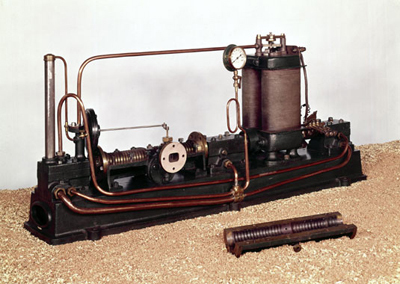 The first practical steam turbines were made by Gustaf de Laval 1882 and Charles Parsons in the 1884. Steam enters on one side of the turbine rotor through the nozzles, pointing at the surface of the turbine blades, and leaves from the opposite side of the rotor. The impact of the steam on the curved turbine blades causes the turbine rotor to turn. The speed of rotation was 30,000 r.p.m. The original de Laval turbine had a single stage rotor which was used as a test bed to try out different numbers and different designs of nozzles. Parsons' turbine was the forerunner of modern steam turbines. It had multiple stages and drove a generator, also of his own design, mounted on the same shaft and generating 7.5 kW of electricity. The tiny blades on the high pressure sections of the rotor and stator are only a quarter of an inch (6mm) square. They were curved in cross section with a sharpened leading edge and a thickened back section. There are original examples of these turbines in the Science Museum in London and the Deutsches Museum in Munich. High pressure steam is fed through a set of fixed nozzles in the turbine stator to the turbine rotor (runner) and passes along the machine axis through multiple rows of alternately fixed and moving blades. From the steam inlet port of the turbine towards the exhaust point, the blades and the turbine cavity are progressively larger to allow for the expansion of the steam. The stator blades in each stage act as nozzles in which the steam expands and emerges at an increased speed but lower pressure. As the high velocity steam impacts on the moving blades it imparts some of its kinetic energy to the moving blades. There are two basic steam turbine types, impulse turbines and reaction turbines, whose blades are designed control the speed, direction and pressure of the steam as is passes through the turbine. Key to achieving high efficiency in both impulse and reaction turbines is the design of the nozzles. They are normally a convergent-divergent (hourglass) shape which increases the velocity of the inlet steam while reducing its pressure. Increasing the velocity of the steam by means of a flared nozzle output orifice may seem counter-intuitive since water flows faster through a constricted part of a stream or a pipe and squeezing the end of a hosepipe causes the water to squirt out in a long, fast jet. This occurs because the water is an incompressible fluid. Steam on the other hand is a gas and its volume is not fixed but depends on its temperature and pressure. Gas dynamics are therefore quite different from hydrodynamics, however the conservation of energy principle still holds for both fluids and Bernoulli's Law indicates that kinetic energy of a gas increases as pressure energy falls. This flared nozzle design was discovered by de Laval and applies equally to the nozzles of rocket engines whose working fluid is hot exhaust gas. See Rocket Nozzles for more about the principles involved. The steam jets in an impulse turbine are directed by the fixed nozzles at the turbine's bucket shaped rotor blades where the force exerted by the jets causes the rotor to turn while at the same time the velocity of the steam is reduced as it imparts its kinetic energy to the blades. The blades in turn change change the direction of flow of the steam and this change of momentum corresponds to the increased momentum of the rotor. (Descartes - Conservation of momentum). The entire pressure drop in the turbine stage occurs in the fixed nozzles in the stator and there is no pressure drop as the steam passes through the rotor blades since the cross section of the chamber between the blades is constant. Impulse turbines are therefore also known as constant pressure turbines. Steam impulse turbines usually operate at extremely high speeds of 30,000 r.p.m. or more and are thus subject to enormous centrifugal forces. For most practical applications the speed must be geared down. Other than that, the design is relatively simple and the turbine casing does not necessarily need to be pressure proof. In a compound turbine, the next series of fixed blades reverses the direction of the steam before it passes to the second row of rotor blades. Both the fixed and the rotor blades of the reaction turbine are shaped more like aerofoils, arranged such that the cross section of the blades diminishes from the inlet side towards the exhaust side of the blades. This means that the cross section of the steam passages between both sets of fixed and rotor blades increases across the turbine stage. In this way both sets of blades essentially form nozzles so that as the steam progresses through both the stator and the rotor its pressure decreases causing its velocity to increase. The rotor becomes basically a set of rotating nozzles. Reaction turbines are generally much more efficient than impulse turbines and run at lower speeds which means they don't necessarily need reduction gearing. They are however more complex and the high pressure steam makes them more susceptible to leaks between the stages. Pressure compounding uses a series of reaction turbine stages to solve the problem of very high blade velocity in the single-stage impulse turbines. The steam pressure drops across each stage as it gives up its pressure energy while the steam velocity remains fairly constant, changing direction as it passes through each stage. Because the steam pressure drops with each stage of the turbine, the volume of the steam increases correspondingly with every stage so that in high capacity turbines the blades and the turbine casing must in turn be correspondingly bigger for each subsequent lower pressure stage to accommodate this higher volume flow. Impulse turbines are also compounded in a similar way however most turbines use a combination of impulse and reaction stages. 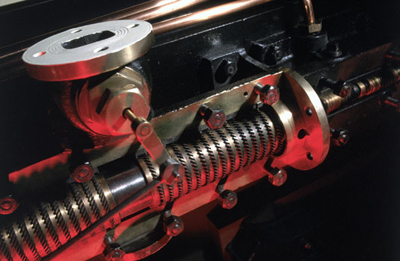 Velocity compounding uses a series of impulse turbine stages. The input nozzles direct high velocity steam onto the first set of moving blades and as steam flows over the blade it imparts some of its momentum to blades losing some velocity, giving up its kinetic energy to the moving blades. There is no change in velocity of steam as it passes through the fixed blades. In this way the velocity of the steam reduces as it passes through the sets of moving blades of the turbine while the steam pressure remains fairly constant across the turbine. The exhaust steam from the low pressure turbine is condensed to water in the condenser which extracts the latent heat of vaporization from the steam. This causes the volume of the steam to go to zero, reducing the pressure dramatically to near vacuum conditions thus increasing the pressure drop across the turbine enabling the maximum amount of energy to be extracted from the steam. The condensate is then pumped back into the boiler as feed-water to be used again. Water vapour seen billowing from power plants is evaporating cooling water, not the working fluid. Back-Pressure Turbines, often used for electricity generation in process industries, do not use condensers. Also called Atmospheric or Non- Condensing Turbines, they do not waste the energy in the steam emerging from the turbine exhaust however, instead it is diverted for use in applications requiring large amounts of heat such as refineries, pulp and paper plants, desalination plants and district heating units. These industries may also use the available steam to power mechanical drives for pumps, fans and materials handling. The boiler and turbine must of course be oversized for the electrical load in order to compensate for the power diverted for other uses. Steam turbines come in many configurations. Large machines are usually built with multiple stages to maximise the energy transfer from the steam. To reduce axial forces on the turbine rotor bearings the steam may be fed into the turbine at the mid point along the shaft so that it flows in opposite directions towards each end of the shaft thus balancing the axial load. The output steam is fed through a cooling tower through which cooling water is passed to condense the steam back to water. Turbine power outputs of 1000MW or more are typical for electricity generating plants. Steam turbine systems are essentially heat engines for converting heat energy into mechanical energy by alternately vaporising and condensing a working fluid in a process in a closed system known as the Rankine cycle. This is a reversible thermodynamic cycle in which heat is applied to a working fluid in an evaporator, first to vaporise it, then to increase its temperature and pressure. The high temperature vapour is then fed through a heat engine, in this case a turbine, where it imparts its energy to the rotor blades causing the rotor to turn due to the expansion of the vapour as its pressure and temperature drops. The vapour leaving the turbine is then condensed and pumped back in liquid form as feed to the evaporator. In this case the working fluid is water and the vapour is steam but the principle applies to other working fluids such as ammonia which may be used in low temperature applications such as geothermal systems. The working fluid in a Rankine cycle thus follows a closed loop and is re-used constantly. The efficiency of a heat engine is determined only by the temperature difference of the working fluid between the input and output of the engine (Carnot's Law). Carnot showed that the maximum efficiency available = 1 - Tc / Th where Th is the temperature in degrees Kelvin of the working fluid in its hottest state (after heat has been applied) and Tc is its temperature in its coldest state (after the heat has been removed). To maximise efficiencies, the temperature of the steam fed to the turbine can be as high as 900°C, while a condenser is used at the output of the turbine to reduce the temperature and pressure of the steam to as low a value as possible by converting it back to water. The condenser is an essential component necessary for maximising the efficiency of the steam engine by maximising the temperature difference of the working fluid in the machine. Thus the heat engine is responsible for most of the system energy conversion losses. Note: This only includes the conversion of the heat energy in the steam to mechanical energy on the turbine shaft. It does not include the efficiency loss in the combustion chamber and boiler inconverting the chemical energy of the fuel to heat energy in the steam nor does it include the efficiency losses incurred in the generator if the turbine is used to generate electricity. Taking these losses into account, the overall efficiency of converting the fuel's chemical energy in coal and oil fired plants to electrical energy is typically around 33%. The steam turbine drives a generator, to convert the mechanical energy into electrical energy. Typically this will be a rotating field synchronous machine. These machines are described more fully in the section on Generators. The energy conversion efficiency of these high capacity generators can be as high as 98% or 99% for a very large machine. Note: This means that a 1000MW generator must dissipate 20 MW of waste heat and such generators require special cooling techniques.